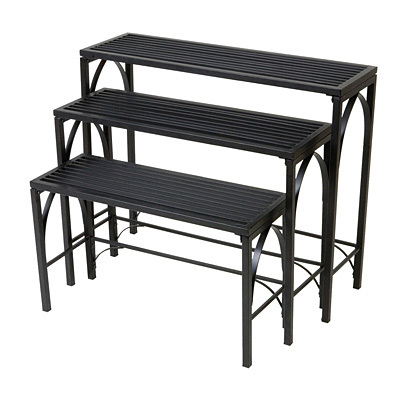 Create a unified look on your patio, deck, or in your home using the Panacea Gothic Nesting Tables, set of Three. Each of these tables has a grate-like top, perfect for housing potted plants. The leg braces all feature a pointed, gothic style arch in the center, adding some architectural interest to the units. Square bar construction creates a sturdy table, while lending a contemporary look to the piece. Place the large table along a wall, and put the other two underneath for a multi-leveled display. For more versatility, arrange the tables separately in an area. The black color lends a timeless look, and the powder coating and metal construction protect the tables from the elements. Each table assembles quickly and easily, using the included hardware. Elevate your favorite plants in your home or yard with the Gothic Nesting Tables, set of Three. Some assembly required.